The Main Window provides both the navigation and the data management functions. From the Main Window it is possible to add, modify and delate individuals, families, additional data and relations. It can be used for data input, even for corpuses of large dimensions. On the upper left side, there are the Navigation Tabs : Corpus, Individuals and Family. The Corpus tab contains general information on the dataset. The Individuals tab contains the list of all individuals and the general information related to them. The Family tab contains the list of all the families of the dataset. Ego's Identity Number. Each individual has a unique Id number which serves to identify it in all contexts (such as matrimonial circuits, or in the kinship section of another individual’s page). Ideally, this value should be assigned one and only one time. However, by clicking on it, it is possible to change it. If you re-assign an already used value, Puck notifies it in an error window. Ego's Gender. In the Individuals Tab, gender is represented by a circle for women, a triangle for men and squares for individuals whose gender is unknown. In every individuals frame, gender is represented by the commonly used symbols : ♂ for men, ♀ for women and ⚲ for unknown. Here, it is possible to change the gender of the selected individual by clicking on the symbol. The individual’s first name and last name. When importing or exporting kinship data, Puck identifies separate parts of names by a slash “/”. The name part before the first slash is identified as first name and all the other parts as the last name. However, any number of names can be distinguished by using the slash separator. The two name fields are auto-completing. In order to facilitate data entry, clicking on the name make a drop-down menu appear in which all first and last names of the corpus are displayed. On the right side of the Identity Frame, a specific section is shows Ego's parents, who are designated by their gender, names and Id Numbers. Next to it, the yellow circles indicate their Union Status. If Ego doesn't have a parent and you want to add one, click on the name field and either choose an existing individual or create a new one by typing a non-assigned number. Under Ego's Identity frame, the first one is the Partners frame, which contains information about Ego's spouses ; the second one is the Children frame, which contains information about Ego's first degree descendants. The Additional data frame contains the individuals/family attributes (such as, i.e., events dates and places). All these attributes are exogenous properties (date and place of birth/marriage/death, occupation, etc.) and can be used to partition the corpus (see here). Puck distinguishes three different categories of attributes and regroups them in separate sections. All attributes are characterized by a label (for which standard individual property codes should be used) and a value. For instance, a property with the label “OCCU” and the value “merchant” means that the individual’s occupation is that of a merchant. When importing gedcom files, relational properties are automatically transformed into properties of the concerned individuals with reciprocal alter specification. For a list of standard property codes and guidelines for personalized property codes click here. In order to add an individual/family attribute : on the Additional Data frame headline, click on the "+" button and a line will then appear inside the frame. Click on the first cell from left and type the right property code (i.e., "BIRT_PLACE") ; then, in the second cell from the left, type the corresponding value (i.e., "New York") and press enter. 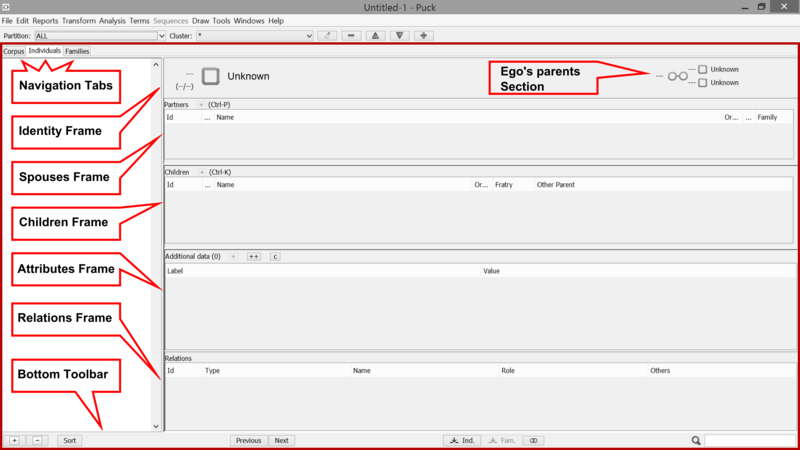 In order to add an existing individual/family attribute, in Ego's Additional Data frame headline, click on the "++" button. This will make all the existing properties appear, so that you won't have to type the property code again! If you want to clear Ego's Additional Data frame, on the headline, click on the "c" button. This will erase all empty attributes. In order to remove an an individual/family attribute : on the Additional Data frame, select the attribute to-be-removed, right-click and click on "delete". In order to remove (or to make changes on) all attributes, see here. Even an ego’s property with specification of alter and automatic attachment of a reciprocal property to alter with specification of ego still remains a combination of individual properties and is not a relation property. This is important when these properties are used to partition the corpus or to restrict a relational or matrimonial census to a subcorpus. For instance, search results for matrimonial rings among individuals whose marriages lie within a certain period may well contain marriages outside that period, if both partners have been married before or after. The last number of a date is automatically interpreted as year (important for partitioning). This must be taken into account when the specifying events occurred before, after, or around a certain year. One and the same label cannot be used at the same time for a simple property and for an event property. For example, the code MARR cannot be used at the same time to indicate if a person is married (simple property) and when, where and whom he or she is married to (event property). “Notes” are simple properties with the only difference that they allow entering long texts and line breaks. The label of notes (“NOTE”) is not displayed and cannot be chosen or changed. All attribute fields (with the exception of notes) contain drop-down menus which allow choosing among existing label, value, place, and date data and existing individuals (for alter). The drop-down menu for alter contains identity numbers and names of all individuals in the corpus, just as for kinship relation entries. The Relation frame contains the list of Ego's alters of a specific relation (for its use, see the relation model paragraph). On the headline of each frame the number of the respective relatives (number of spouses or children) is indicated. By double-clicking on the name of a related individual in each frame, you can jump to its individual page. Jumping from one relative to another is a way to navigate through the corpus along kinship paths. The Family tab looks just as the Individuals one, apart from the fact that records are families and not individuals. Families have Id numbers, they are listed in the left side box ; they have an Identity frame, as well as a Children and an Additional Data frames. If you wish to change the Union Status of a single union (i.e., from "married" to "divorced") you can simply click on the Union Status symbol until reaching the right setting. choosing the default Union Status (married, divorced, unmarried). In order to remove a descent tie : move to the Family navigation tab, select the family where appear the tie-to-be-removed, in the Children frame select the right child/children, in the Bottom Toolbar click on "-". In order to remove a union : on the Family navigation tab select the family to-be-removed, on the Bottom Toolbar click on "-". Then, move to the Individual navigation tab, select one individual from the couple to-be-removed and, in the Partner frame right-click on the partner and click on "Delete". A Search Dialog Box is located on the right-side of the Bottom Toolbar (bottom right-hand corner of the main window). It allows searching for individuals or families through the dataset. This can be done either by entering the name, a name part or the Id number of the searched individual(s). If several individuals fit the search criteria, successive “enter” clicks permit to pass from one selected individual to another, and thus to navigate through the corpus. This can be useful, for instance, when a family name has been entered, when the same individual appears in more than one family, or in cases of homonymy.